iven and kashmira – jesus. bangkok. neighbors. us. Welcome, dear friends to our blog. Here you’ll find musings from our journey with Jesus on the streets of old Bangkok. 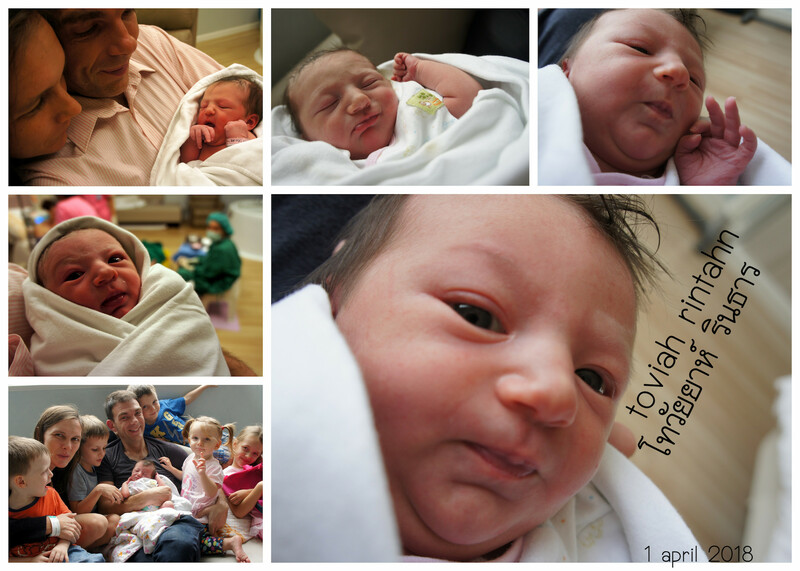 We welcome our daughter Tirzah Rueng Hauptman, born July 24, 2016 at 5:12pm. 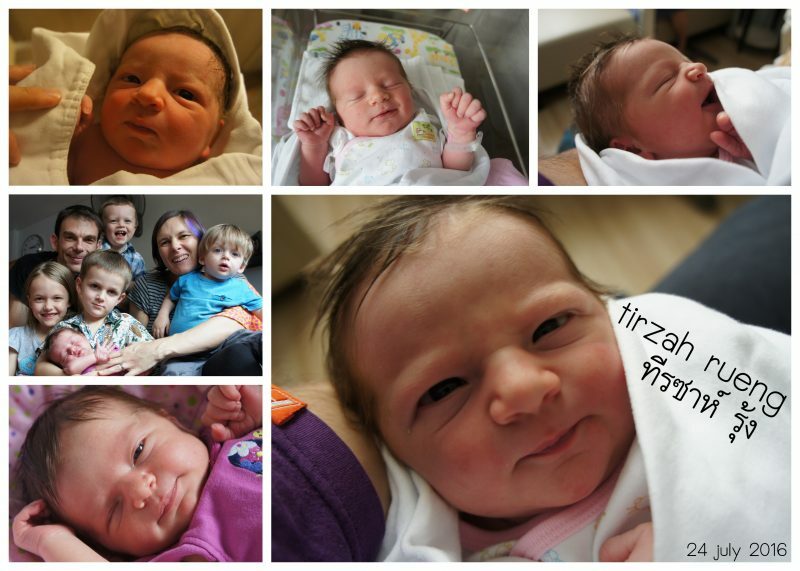 We celebrate your birth little Tirzah! Now, with baby #5 aggressively wiggling inside of me, presumably hunting for the exit, but with no imminent signs of labor despite being 9 days “late”, I no longer get stressed out or succumb to the irrational thoughts that if the baby hasn’t come yet, she is not going to come. She will come. She has to get out somehow, eventually. This week we are going about our life, but well aware that, depending on the time of day and traffic patterns our hospital is anywhere from 25 minutes to more than two hours away, and the last labor was just 2.5 hours total. With that always in our minds, we live life with the kids, eat papaya salad and sticky rice outside on the street as usual, do laundry, meet with teammates, greet neighbors, and go about living – albeit very close to home – with friends who can take our kids at a moment’s notice and our packed hospital bag (including the “just in case” bag of extra towels, etc. if traffic doesn’t allow us to get there in time). “Regular life” goes on, give or take, but we are all constantly wondering in the back of our heads which moment a strong contraction will signal that it is time to change plans, or when exactly my water will break. We don’t usually live life like this, and I am glad about it. That said, Iven was reflecting today about how this “waiting for baby” season could and honestly even really does reflect the invitation we have as Believers to live in constant awareness and faith in Jesus’ imminent return. He is coming – it will change everything – and though we don’t know when, the fact that it hasn’t happened yet does not, in any way, mean His return is less certain. There is a unique sort of certainty of few things in life – birth, death, and Jesus returning as King are some of the only ones. Right now every minute of our days are held in the tension that plans could change dramatically within a course of a few minutes. Really life is always like that, but waiting for a baby is one of those seasons that reminds us of the acuteness of things being sure, and unsure, all in the same moment. What would it look like for me to live in full awareness that Jesus IS returning, that everything will be different when He does, and that although we know not the “when” our uncertainty of the timing does not in any way reflect the certainty of that most life-altering of realities. Scripture warns us to not go back into our house for anything, but to be ready to GO. Our family is postured that way this week, but if all of us could be living that way always, how would it change this day? During our visit to Seattle, some Catholic friends invited our family to attend a. Christmas party held at their cathedral’s fellowship hall. Our collective eight little people enjoyed meeting each other (again – the nature of living in Thailand is that our kids “meet” their Stateside friends anew about every two years), doing some Christmas crafts, singing carols and eating treats. When we got up to leave our friend suggested giving us a small tour of the cathedral just next door, where their family worships. Walking through the doors into the beautiful and amazingly-high ceilinged cathedral, whose doors are always open, we were struck as a family with the hush of holiness that filled the air. Our friend, Sarah, pointed out the icons, statues, and different parts of the cathedral and explained how they celebrate mass together in that space. As we stood quietly talking near the wall, our five-year-old, Izayla, who has been attending Thai preschool for two-and-a-half years, watched intently as a man approached the altar at the center of the vast room, knelt down to cross himself and then walked out. She looked up at us and clarified, “This is a place where people worship Jesus, right Mama?” I answered with a confident, “Yes,” and she quickly turned away from us and hurried toward the altar. Without missing a beat she knelt down, pressed her hands together in a high Thai “wai” (the well-known gesture of Thailand used in both greetings and worship) and then returned to us, her face beaming. Many times, as we walk home from the bus, past the shops that build the gold-painted idols and images, she has asked questions about who those gods are, how Jesus is different, the significance of our family choosing to worship Jesus alone, and on and on. There, at that Catholic cathedral, so far away from the Thailand she calls home, our daughter was overcome by what she saw as an opportunity to worship the God who loves her in a form that quietly reflects the style of worship she sees in her everyday life. The colliding of worlds, and honest desire to worship was both beautiful and holy, expressed in our five-year-old. We wanted to share with you some highlights from 2015 – it was quite a year! Click on this link to read our end of the year Christmas Greeting and Highlight Newsletter! All grace and peace to you! “Lek” is a regular and recognizable woman in her 20s who many of us are quite fond of from our streets. She has some developmental disabilities and a very low image of herself. She shared with Kashmira in passing once that her mom had her sterilized in her early teens to make sure she would never become a mother herself, though she loves kids (and enjoys participating in kid’s club alongside the children). Hi Friends, our wordpress blog of 9 years finally bit the dust – it was hacked beyond repair sometime in October. We realized that our website was down mid-November and finally decided to delete it all and try to start from scratch re-uploading (most of) the previous content. Please bear with us as we seek to restore (and maybe even update!) this blog over the next few weeks. One of our neighbors, Tua Reh, has become especially precious to our team these past months, even as doors have been opening to share with him who God is. Iven and I have known (seen) Tua Reh for years – I used to refer to him as “the veteran” because at that time he had a scruffy little beard and camo-colored hat he always wore over his gaunt frame. For years we weren’t sure if he could speak, and though he would often stand nearby clearly showing interest in our family, and even occasionally lift his hands in a traditional Thai greeting, if we talked to him he woul disengage immediately and disappear like a scared cat. Matthijs and Lilian managed to get his name (or a version of it) from some other people who live on our streets, and they were determined to build a friendship with Tua Reh. The week the doors were officially opened to our new building we would often see Tua Reh standing outside watching us, in a friendly and curious way, but if someone went out to greet him he would scamper off immediately. After a few days of this, I saw him sitting at our stone table in ront, and I hurried to fill up a cup of water and bring it out to the table without a word, running back inside before he had a chance to disappear. He took the water. Naam was sixteen when we met her and her mom living under a bridge five years ago. Both of them are “little people” and although Naam had virtually never been to school, her intellect and English were both noteworthy. Our team journeyed with Naam during those first years of friendship through a pregnancy that resulted in the baby being removed to a group home, and several attempts to help her obtain a government ID card for the first time in her life. Although she was a full Thai citizen her mother had failed to register her birth at the district office and the birth records were no longer accessible, so she had no rights to schooling, health care or any sort of government aid… Many things about Naam’s life seemed hopeless, and we began to see her less and less and then nearly not at all for several years.